The Iris Prize LGBT+ Film Festival is in its 12th year, taking place in Cardiff from 9 to 14 October 2018 to share and celebrate exceptional LGBT+ stories from all over the world. What makes this festival special is its focus on exploration: with filmmaker Q&As, panel talks and plenty of opportunities to socialise, Iris is a place where discussion is welcomed. Before I applied for my internship with Iris Prize, I hadn’t heard of the festival at all. I am relatively new to Cardiff, but I love all things film so immediately knew the Iris festival was the place for me. The Iris attitude is to bring people together, and it’s not just for the LGBT+ community – as a straight woman, I see so much in the festival for me. It is created for everyone, everyone who can get themselves to Cardiff, to watch some beautifully made films and discover things you perhaps had never considered before. Iris is inclusive and its mission is to spread outstanding LGBT+ stories far and wide. I’ve had the privilege to watch a handful of the films being shown at this year’s festival and was particularly drawn to Brazilian director René Guerra’s short film Profane Cow (Vaca Profana). Following a transgender woman, Nadia, on her quest towards motherhood, the film raises questions about gender and maternity. We are invited to contrast the character of a cis woman who feels a disconnection from her own child with Nadia’s aching, overwhelming belief that she is meant to carry a baby. Nadia craves a pregnant body and the padding she wears seems so much part of her that when it is cut and torn away in a scene where she struggles to breathe, the act almost feels gruesome. This year 35 short films are competing for the Iris Prize: £30,000 to make a new film. There is also the Best British Short award, with 15 films competing. There are some incredible shorts from women directors, including Erica Rose’s Girl Talk, exploring connection and intimacy in Brooklyn’s queer femme community and Sherren Lee’s The Things You Think I’m Thinking, an unforgettable film which leads you to question your assumptions as you watch a date unravel between two men, one of which is a burn survivor and amputee. I especially loved Emma Gilbertson’s Crashing Waves, one of three British films entered for both the Iris Prize and Best British categories. A clash of aggression and intimacy, two men unleash their frustration over forbidden love through movingly choreographed dance on an inner-city housing estate. Notions of masculinity are being interrogated and explored by women directors such as Gilbertson and I personally can’t wait to hear the discussion around this. Again, I am grateful for Iris’s focus on conversation and hope I can catch the many Q&As happening throughout the screenings! Iris also has a programme of thirteen non-competing feature films showing throughout the week. Eva & Candela is one to watch out for. Directed by Colombian Ruth Caudeli, the film explores the exhilaration of connection and the agony of it turning stale as it follows the decline of a relationship between two women. The intimacy between the lead characters feels bold and truthful and the frank, explosive dialogue keeps your eyes glued to the screen. Although I haven’t had the chance to watch many of the feature films showing this year, some of them look spectacular, and I’m particularly looking forward to Dykes, Camera, Action!, a documentary directed by Caroline Berler about lesbian filmmakers working against a reluctant film industry to present queer identities on screen. Panel discussions, filmmaker Q&As, lunches, parties and the much-anticipated awards show, the Iris Carnival, will keep festivalgoers celebrating, networking and chatting throughout the six days. For the first time in the festival’s history, there is also a secret pop-up venue which will include the chance to watch the films created by past winners of the Iris Prize! I have yet to watch all of the films being shown this year, and I sincerely hope I have the time to catch them in the festival week, but based on the ones I’ve seen so far, there has been a single prevailing message – the fact that ultimately we are all searching for acceptance, for a sense of belonging. This festival’s declaration of acceptance is loud and clear, and even if you can only make it to one of their film screenings this year, you will no doubt feel the excitement and warmth the Iris team couldn’t hide if they tried. All short films can be found in the themed programmes of shorts screening at Cardiff’s Cineworld throughout the festival week. You can find the full Iris Prize festival programme, including feature films, parties and discussions on their website. Read our blog about last year’s festival. Both pictures courtesy of Iris Prize. Picture one credit: Ana Jaks/Iris Prize; picture two is a still from Vaca Profana, directed by René Guerra. 1. 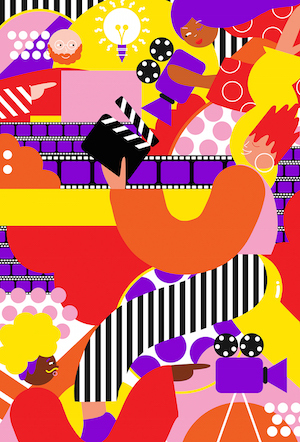 A colourful artwork illustrating the festival’s programme, featuring cartoon figures of filmmakers with cameras and clapper boards, rolls of film stock and an electric bulb. 2. (And feature image) A person with a slightly wrinkled face and long dark hair, their mouth ajar, is looking at someone whose blurred back of the head we see in the foreground on the right. There are square objects, perhaps small mirrors, hanging on the thread from the ceiling between the two people.